Each coin is struck on a 900 Fine Gold planchet and weighs 8.36 Grams (.0.2419 oz Fine Gold). The obverse features a crowned portrait of King George V. The reverse bears Canada's Coat of Arms which was originally adopted in 1868. 1912 $5 Canadian Gold Reserve PCGS MS-64 Gold Coin Highly graded by PCGS as an MS-64, this gold coin is slabbed and carries a red Canada label with a unique PCGS certification number. 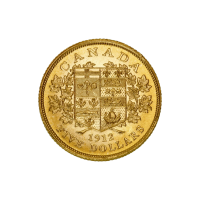 For over 75 years a group of Canada's first gold coins have been stored at the Bank of Canada as a part of the Government of Canada's Exchange Fund Account. These safeguarded coins became available to collectors in late 2012, allowing collectors a unique chance to own a piece of Canadian history. Each coin was struck over 100 years ago and remained untouched since then. Each coin is struck on a 900 Fine Gold planchet and weighs 8.36 Grams (.0.2419 oz Fine Gold). The obverse features a crowned portrait of King George V. The reverse bears Canada's Coat of Arms which was originally adopted in 1868.